Every year students of all ages and backgrounds apply for various grants, bursaries, and scholarships to make their education more affordable. Scholarships are particularly important, as they are an excellent way to recognize and reward students for their hard work while encouraging them to continue to do their best. It is essential to celebrate students for their academic achievements, and a scholarship award certificate gives them an important document to place in their portfolio. What is a scholarship certificate? A scholarship certificate is an award that is given to a winner of a scholarship program. It is a printed document that is granted to the scholarship holder and it includes winner’s name and achievements. This certificate can be either framed or placed in their portfolio along with any diplomas or degrees, excellence awards, and letters of recommendation. Having a certificate to accompany a scholarship award, which is a form of financial aid that is granted to a student to help them continue their education, is an excellent addition to any student’s record as additional proof of their achievements. Scholarship opportunities are awarded based on a number of criteria, including grades, achievements in science, and excellence in sports. Since scholarships are awarded for different reasons, the student may want to use the certificate in their portfolio as evidence of their GPA, art talent, or athletic skills, depending on why they received it in the first place. Having clear, concise information about the scholarship will allow the student to easily share what they accomplished to merit the award. The institution they attended when they received the scholarship. The date it was issued. What type of scholarship it was (merit-based, career specific, college specific, athletic, or creative). The reason they received it. The name of the scholarship. The organization or person who awarded the scholarship, with a signature. Creating a scholarship certificate to hand to the recipient is an important task. This piece of paper will soon become a meaningful document in the student’s portfolio as proof of their accomplishments and should be done so in a professional and elegant design. Make your next scholarship certificate with one of our professionally designed printable certificate templates to help leave a lasting impression. Simply download award template of your choice and customize it as needed. This modern scholarship certificate has a simple and sleek design that looks both professional and attractive. The swooping ribbons in gold, navy blue, and maroon are a great compliment to the silver medal in the left bottom corner. This template is an excellent choice for any kind of scholarship award - for example, to support participation in summer or academic year immersion programs, or for strong academic performance. 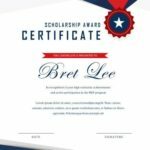 This free printable scholarship certificate gives off a patriotic feel with the blue and red design, featuring a white star medal. It has a stylish portrait layout with plenty of room for text and can be used for any type of scholarship - for example, for a scholarship that helps qualified high school seniors defray the costs of pursuing a degree. This delicate, pastel blue design sports an attractive border and classic ribbon banner, giving this award certificate template an authentic and academic feel. This vintage-inspired design is an excellent choice for a number of scholarship certificates.